Next Steps: Stay Tuned & Get Connected! Canada Lands Company finalizes Community Design Plan (CDP) & submits to City of Ottawa with supporting reports such as Environmental Assessment (EA) Master Plans for Transportation & Servicing Infrastructure which include impact assessment and mitigation plans. City of Ottawa begins public & technical agency review to prepare recommendation to Planning Committee. City of Ottawa publishes notice for EAs and Planning Committee agenda on website & in newspaper. EA Reports available for public review. City of Ottawa holds public hearing at Planning Committee - Public can provide comments. Planning Committee makes recommendation on CDP and related Secondary Plan Amendment to Official Plan to City Council. City Council makes its decision on CDP & related Secondary Plan Amendment. Canada Lands Company applies for plan of subdivision & zoning for Phase 1. First residents move in by 2017-18. Stay in touch by registering your email address, or like us on Facebook! February 20, 2014: Canada Lands Company would like to thank everyone who came out to our third public event. 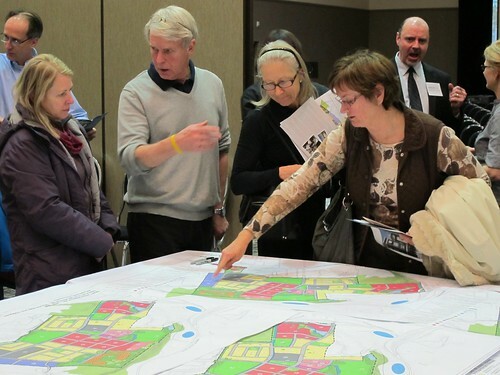 Canada Lands is grateful to everyone who has participated and contributed during this fruitful and innovative public consultation process for the former CFB Rockcliffe. Here is a slideshow of photos taken during the event. Please keep checking back for new updates about the project, and like us on Facebook to keep the conversation going!